"What do you MEAN they're doing another one?!" Shocking everybody—including, possibly, its own producers, who already burned through all three of the books it’s based on, not to mention, like, half their cast—Fox has announced that it’s renewing its apocalyptic sci-fi show Wayward Pines for a second season. (It’s like the made-up phrase “event series” has suddenly lost all its marketing-fabricated meaning.) The new series will apparently pick up after the timejump established in the show’s first-season finale, with a “new resident” arriving in a Wayward Pines now under the control of its own militant youth. 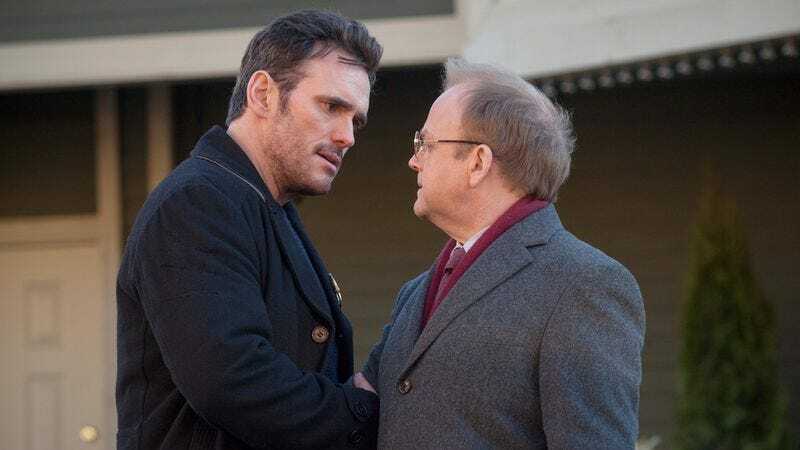 There’s no word yet about who’ll be returning for the second season—although it would be pretty weird if Matt Dillon was back, given the events of the finale—but we do know at least one person who won’t be: showrunner Chad Hodge. Fox hasn’t announced his replacement yet, but they did make it clear that his fellow executive producer, M. Night Shyamalan, would be staying on for at least another year. “Wayward Pines was a huge hit for us this past summer,” a Fox executive told Variety about the renewal. “We were absolutely blown away by the mysterious and surprising world that Night and his team created, and the twisting-and-turning storytelling that drew viewers in from day one.” Which, besides presenting pretty clearly the mercenary motivations for the surprise second season, also serves as your periodic reminder that people who are friends with M. Night Shymalan constantly refer to him as “Night.” So that’s fun. Anyway, Wayward Pines will presumably be back next summer.